We love knowing our clients are happy! Here are a few of our favorite reviews. Find more on Facebook, Yelp, Wedding Wire, and The Knot! "We are so happy that we chose Vicki and Two Chicks and a Rooster to cater our wedding in September! 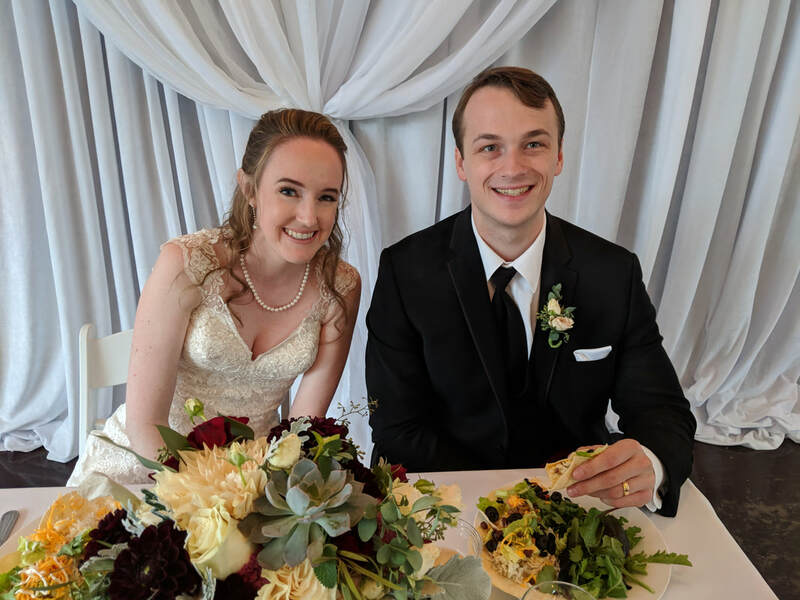 We chose a taco bar, which was delicious and our guests are still talking about the food! The presentation of the food was great as well. We also chose appetizers and mini-cupcakes for our dessert table. The cupcakes were a hit! Vicki is a great communicator, and was able to answer all of questions quickly and with great detail. Her staff on the day of the wedding was professional and friendly as well. We couldn't have asked for a better experience, we highly recommend!" "Two Chicks and a Rooster are phenomenal! Vicki is top notch. She is open to your ideas, and gives great suggestions. The food is delicious, and the staff are so attentive. 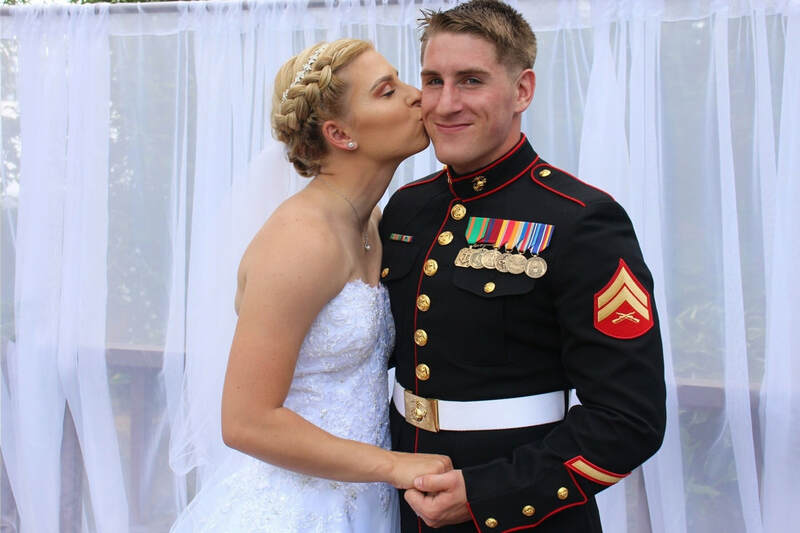 Two Chicks and a Rooster helped make our wedding reception such an amazing event." "Vicki and her team are the BEST! I can't say enough good things about her/them! I felt so fortunate to have TCR cater my wedding - everything from their service and buffet table decor to the food was exceptional. Throughout the wedding planning process as well Vicki was so gracious, accommodating, and helpful - working with my budget and finding the best, delicious approach to my special day. Our guests are still raving about the BBQ chicken, cornbread, and spinach + strawberry salad!" ​"Brice and I couldn't of been more pleased with everything, you will most certainly be a number one recommendation for our friends!" ​"Just wanted to thank you again Vicki! The rehearsal dinner was wonderful, food and service were fantastic! My son and new daughter in law have thanked me a hundred times for the whole thing, they loved it! I will highly recommend you to everyone who needs a caterer in your area. You're the best!" "We had the privilege of working with Vicki and her team and let me just say, THEY ARE AMAZING! Hands down the best caterers we have ever worked with (and we work with over 30 or more a summer) They take care of everything and their food is delicious! I HIGHLY recommend them! It was such a pleasure to get to work alongside Two Chicks & a Rooster Catering!" "Vicki with Two Chicks & a Rooster is amazing! Our entire experience with Vicki, from start to finish, was absolutely wonderful. Vicki catered our rehearsal dinner and wedding day.... I never pictured a caterer putting so much thought into matching their tables with our decor and vision. Vicki asked us about themes and colors and overall style we envisioned for our day. Of course the BBQ menu we went with was absolutely delicious! We had lots of guests tell us how much they enjoyed it. 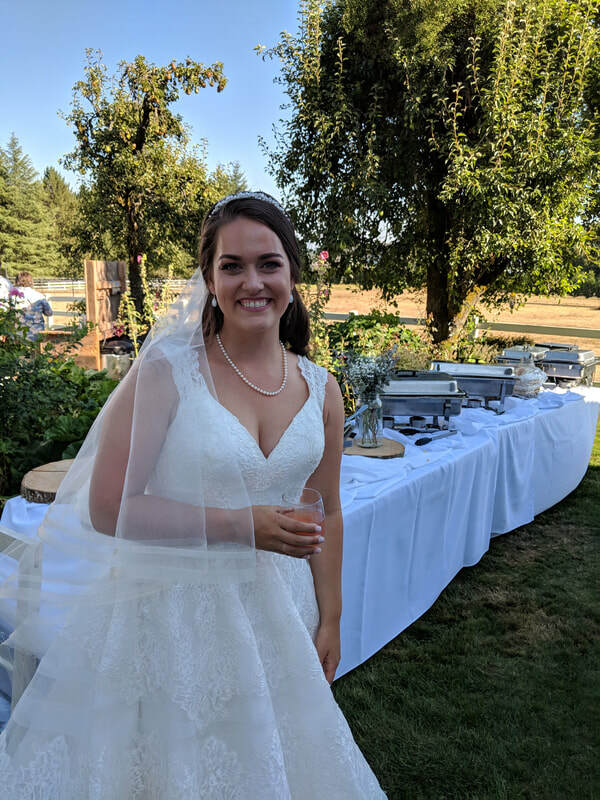 The day of, Vicki and her team team lit all of the tea lights on the tables, scrubbed rental plates, and helped pass out the champagne toast, all of which they were not required to do. Truly above and beyond. During dinner I watched Vicki go from table to table and talk to our guests, making sure everyone had what they needed and were enjoying their meals. She is truly a wonderful woman and business owner. Please don't hesitate to hire Two Chicks & a Rooster! You won't regret it. Thank you for making our day so special, Vicki!" "I couldn't recommend Two Chicks & a Rooster more! Vicki is a dream to work with! From our very first meeting she went above and beyond to really get a feel for the vision of our wedding. She took care of not only the food but the linens for our tables as well. It was so nice not having to place an order for those things myself. The entire staff amazing. The food was outstanding. Everyone raved about it. I wish I would have been able to eat more at my wedding but even the leftovers the day after were delicious! I will without a doubt be calling Two Chicks and a Rooster next time I need an event catered." 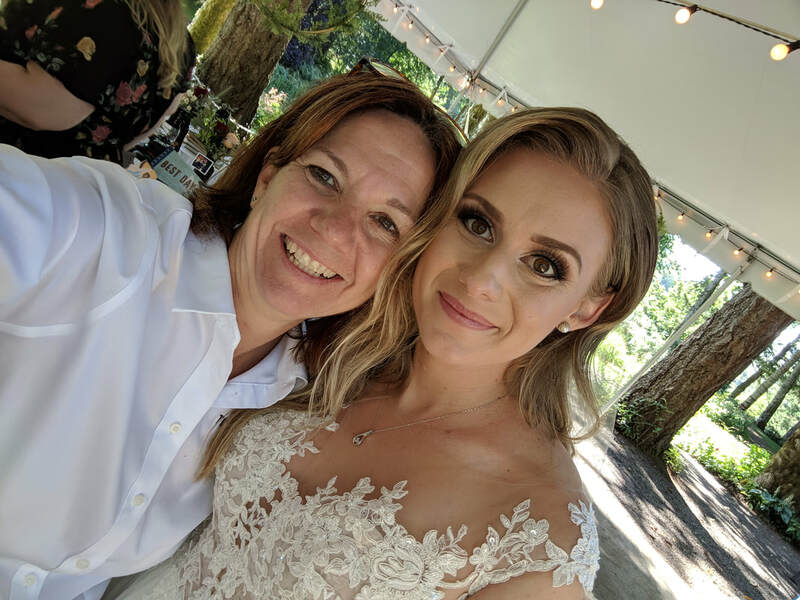 "I could not be happier with the outstanding service and fabulous food that Two Chicks and a Rooster catering provided for my recent wedding. My guests continue to compliment the excellent menu, great service and food presentation. Vicki Irish worked very well with our Italian theme, even added chicken caccitore to our menu that is not something they normally make. They incorporated our florists ideas, theme and colors into the buffet table design for a well coordinated look. Vicki was very professional, responsive and inspired our confidence immediately. We had a fabulous wedding. Initially we were worried about having to deal with all the logistics involved with food, chairs, tables, linens and plates etc. Two Chicks took all of that off our hands and seamlessly worked with the event rental company.... including consolidating the bill and saving us money in the process. How easy is that? We enjoyed a worry free reception. My new husband and I are already highly recommending them to anyone looking to have a fabulous event." "Two Chicks and a Rooster were nothing short of fantastic at catering our wedding reception. We had a variety of 'Special Needs' beginning with them working with our own family BBQ. We brought it in from Omaha, and needed someone that COULD and WOULD work with us. Vicki and her crew did an amazing job - The side dishes were selected to meet the needs of some dietary restrictions, and were delicious! Other than my husbands table dance, I believe the food was the next biggest hit of the party. TCR was efficient, friendly, and thorough - VERY pleasant to do business with, very fair pricing, and have excellent communication. I would not hesitate to hire them again." "Absolutely the best BBQ I have had. The rest of the food was beautiful and delicious. We had the best time planning with them and the suggestions they made made life so much easier. I highly recommend them for weddings, parties, or any gathering you might be having!" "Vicki and her team are the best!!! They are so wonderful to plan with and work with. 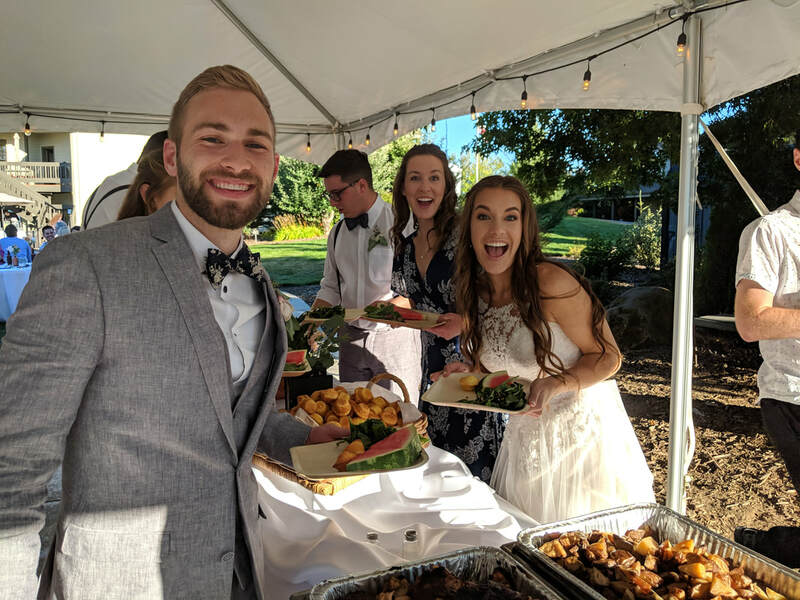 Their food and service at our wedding was amazing! We were so happy with the food and drinks, as were all our guests!!! I am so beyond happy with this wonderful company!!!"